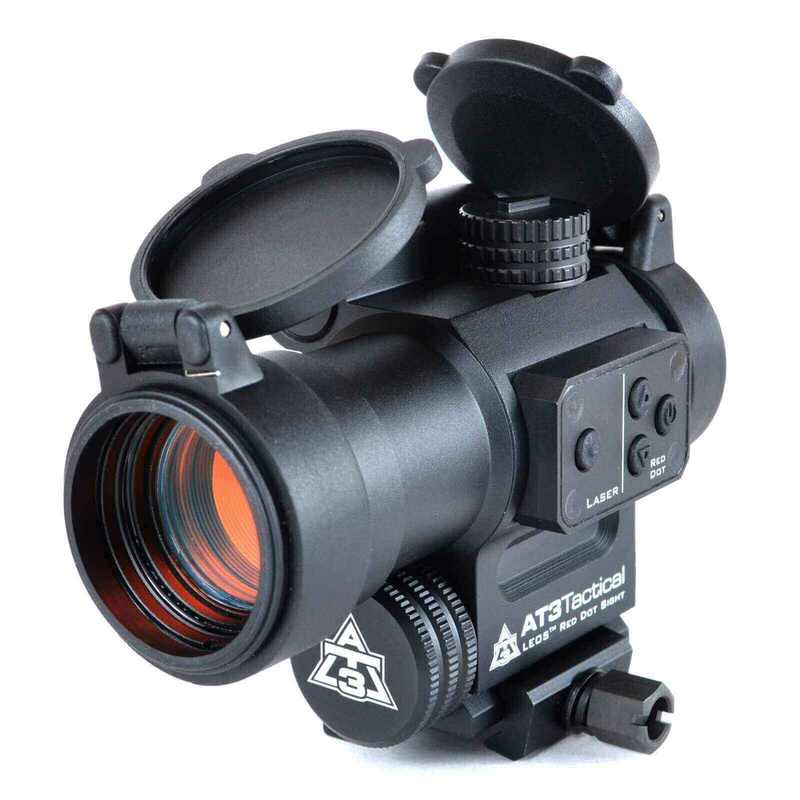 The AT3 LEOS™ is ideal for home defense, tactical & law enforcement, hunting, plinking, competitive shooting, or any shooting scenario where magnification is not required. Optimized for AR-style rifles, sporting & hunting rifles, shotguns, air rifles, and any other weapon with a picatinny or weaver mounting rail. Precise digital controls for simple control of the sight and integrated laser – switch between red dot only, red dot laser, and laser only modes with the push of a button. Shockproof circuitry rated for impacts up to 800 G’s – it can handle any recoil you throw at it. Check out this great video review from Johnny at 180 Second Ideas! This is my third AT3 sight. Now I own all three red dot models they offer, RD 50, RD 50 Pro and the LEOS. I have not had a problem with any, except for deciding which one is my favorite. This was also my first open box item and I could not be happier. Everything was in the box down to the stickers, and I have yet to see any evidence that it was ever touched by anyone else but myself. This sight was actually placed on my Gun Point AR 9mm carbine replacing the Vortex Strike fire I had on it. I love this LEOS system since it has a laser as well as red dot which is perfect for the carbine since I now use it as my in-home defense weapon instead of the AR 15 I was using before. The 9mm is more practical indoors alleviating the over penetration drawbacks of the 5.56 round. All my AT3 sights were extremely easy to sight in, accurate and I have yet to have one wonder off zero. I am a convert and would highly recommend these systems for your weapons collection, these sights are true bang for the buck proven. A friend had purchased one of the AT3 red dots over a year ago, and he had nothing but good things to say about it. Therefore, I turned to AT3 as an option when I was in the market for another red dot sight. I researched their products as much as possible, relying mainly on 3rd party reviews. I was very impressed by the high praise many gave to the sights, and the dissenting opinions had nothing to do with fit or function. I ordered an open box sight, and I was not disappointed. The box held everything I needed, and the sight was in excellent condition. I mounted it to a 233 rifle, zeroed it, and have not had an issue yet. I used a small amount of locktite on the threads of the mount, and it has not loosened. So far I have about 400 rounds through the gun with no issues. This sight is as good as any of my "professional" (read expensive) sights, with no difference in clarity or performance. Plus the lifetime warranty makes the purchase of this red dot a no brainer. I would definitely recommend this sight to anyone in the market for an affordable red dot sight. This is a very nice optic and great price. Oen bx purchased saved a few bucks and had I not know it was an open bix I wuld have never know. Not a scratch on it and works great. I would recommend this to anyone wanting a nice otic without breaking the bank. Shipping was fast. Second AT3 LEOS™ Red Dot I've bought. This one was as good as the full price one I purchased earlier. Only issue was rear cover was too loose, but easily fixed with a little electrical tape underneath. Both sights are solid, large viewing area and bright picture. Allows co-witnessing. Seems to have less "flaring" than my Sig Romeo. Laser stays sighted in after repeated firings. Only issue I found is the sight adjustment "clicks" are not crisp all the time. Also red dot and laser adjustments turn in the opposite direction. Great, reasonably priced sight. My favorite red dot sight. The only thing that would make it better would be an auto-on feature. looks great, was easy to zero and accurate. great experience with ordering and shipping.